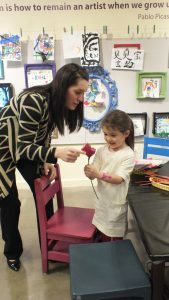 Art Adventures are guided art activities that children and their caregivers can create together and either take home or replicate in the home. 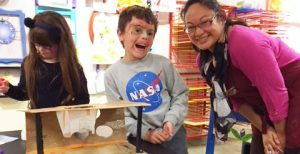 These activities take place daily in the Adventures in Art exhibit from 10 a.m. – 12 p.m. and 1 – 4 p.m. whenever the Museum is open. Shift, alter, flip-flop—play! Create your own charming creatures using natural materials, playfully transforming them into works of art. The Selfie Project: Join us for creative play with expressions and collage techniques to create a tender story all about you. Weather or not, here I come! Explore weather-themed mobiles to celebrate the summer season! Clay, Coffee, and Creativity Lesson: Use your senses to explore the different properties of natural materials as you paint with coffee, mud, and clay! 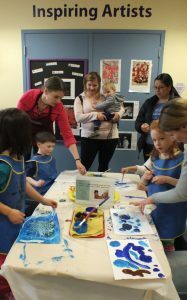 Red Fish, Blue Fish Lesson: Explore colors and shapes, while learning the art of Japanese Gyotaku painting. Tangible Tech Lesson: Have you ever thought of where this stuff ends up when it breaks or you don’t want it anymore? Reuse pieces of technology to create upcycled art. Papermaking Lesson: What can we do with all our paper scraps? Let’s turn them into new paper using the papermaking pour method! Frosty Fabric Lesson: Jack Frost nipping at your nose? Design some cold weather clothes. Be inspired by the variety and textures of colors of fabrics to create art.